if you’ve been following my me-made-may posts over on instagram, you’ve probably noticed a frequently worn cardigan of mine. 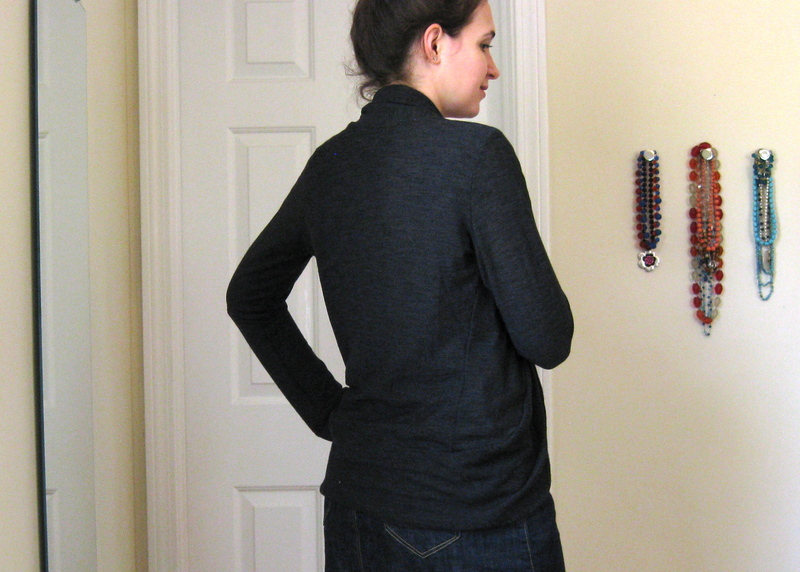 i was needing a good spring weight cardigan—one that could keep the chill off my neck, but not overheat me—so i decided to try the julia cardigan by mouse house creations. it has a shaped, doubled up band encircling the entire neckline and hem, giving it a slight cocoon shape. best thing—no hemming required! sweater knits can be tricksy to hem, so that is a definite bonus. i really wish you could see the details better, but ya’ll know it’s hard to capture dark fabrics! i used a not quite medium weight sweater knit from girl charlee, and it s just perfect for this. the double layered neck/hem band provides a cozy feel, but the slightly open shape keeps it from being too heavy. this pattern is definitely a fabric hog. it used every bit of my 2 yards of fabric. it is rare that i throw all the scraps out after cutting, but i really did have nothing left! as i mentioned, the whole neckline/hem is one giant doubled up circle, and i had to piece one section to make it all work. not a big deal, but if you are working with a stripe or patterned fabric you’d be smart to buy extra! now, this pattern does have the option to cut the circle out of only one layer of fabric, but then you would be stuck hemming that giant edge, and i just don’t think it would look as polished. i wouldn’t even consider making it that way, personally. the sleeves are crazy wide at the bottom. somewhere in the pages and pages of directions it mentions the bell-ish sleeve, but i didn’t think it would be as huge as it is! i could easily take out two inches, and probably will at some point. i am a sleeve pusher upper, and these are way too loose to stay up. the sizing seems pretty spot on, and overall i’m very pleased with this pattern. i mean, i wear it practically every day, so there ya have it. it has served exactly the purpose i intended, and i love the unique shape. far more interesting that just a regular ol’ sweater. Yay for Julia! I love it in a dark solid, I’m after some plain sweater knit for another one. thanks, it’s such a fun cozy sweater! I’ve never heard of this pattern company, but I love the look of your cardigan so it’s time to go check them out! OOC, how many pages is this pdf pattern? I hate printing out 60-page patterns! thanks! it’s worth checking out. the pdf file is 51 pages, but the pattern itself is under 25. if i recall, it was a fairly easy pattern to assemble, as pdf’s go. I’ve recently made one of these too, I love it! thank you! it’s proved very useful! This is so cute on you! I just got this pattern actually, after I saw it on What Katie Sews. I meant to sew it up for MMM, but it’s gotten very hot here in NYC so I don’t need it right now. I’m grateful for your notes- I was hoping to squeeze it out of a small remnant of leftover sweater knit, but it looks like I’ll need to dig up something else. yeah, this won’t fit on small remnants! 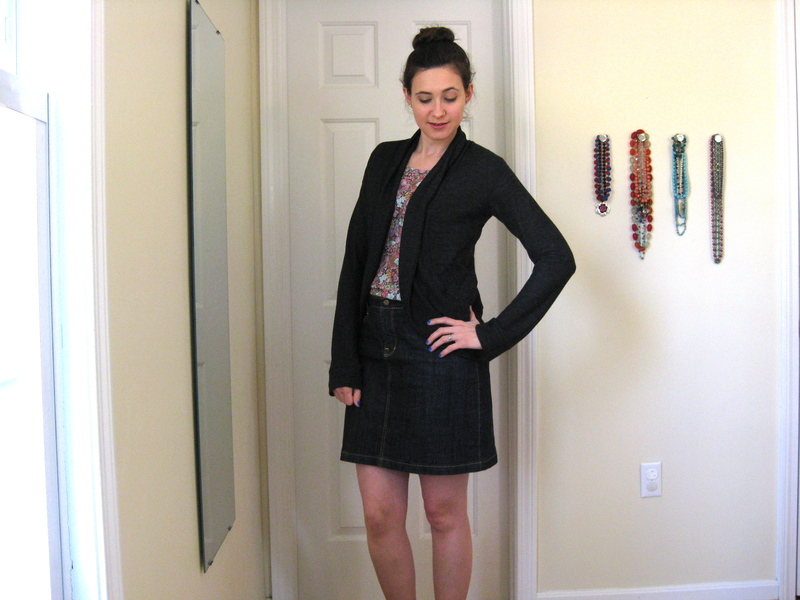 the weather up my way has been all over the place lately–this cardigan was definitely worth making! Such a great basic piece. This has been sitting in my to-make pile forever. I really need to get around to it — currently I have zero handmade cardis! Sleeve pusher uppers all the way! This is a really sweet pattern – the design lines really draw you in! 2 yards of fabric though? Whattahog! I’ve made jackets with less than that and with scraps aplenty at the end of it all. I suppose that’s the price of not-your-standard-design-lines. Looks good on!